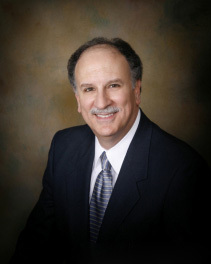 Joseph Casseb has been a lifelong resident of San Antonio, Texas. During and after law school, he served as Court Coordinator for Judge H.F. “Hippo” Garcia, 144th District Court. He was admitted to the State Bar of Texas in 1978. Read more in the overview section below. Joseph Casseb has been a lifelong resident of San Antonio, Texas. During and after law school, he served as Court Coordinator for Judge H.F. “Hippo” Garcia, 144th District Court. He was admitted to the State Bar of Texas in 1978. He served as an Assistant District Attorney for Bexar County from 1978-81 and as an Assistant United States Attorney for the Western District of Texas from 1981-83. He entered the private sector in 1983 focusing on civil litigation. Since 1997, his practice has been primarily devoted to Alternative Dispute Resolution. 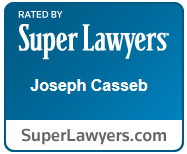 He has conducted over 3000 mediations and has been recognized annually by Texas Monthly magazine as a “Texas Super Lawyer” in ADR since 2008. 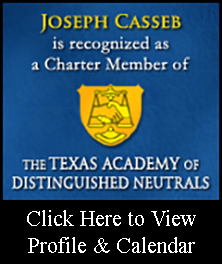 He is a Charter Member of the Texas Academy of Distinguished Neutrals. He has been active as an alumnus of his alma mater, St. Mary’s University School of Law and has served on both the San Antonio and State Bar Board of Directors and participated in various bar activities. For the past 24 years he has maintained an AV peer review rating from Martindale-Hubbell.